Daily Whipout, "The 66 Kid Straddles The Centerline"
Meanwhile, here's a tale of extortion vs. extraordinary on the streets of Mexico. Last Sunday, Kathy, my son and I crossed the border at Nogales and looked for a cab driver. We traditionally like to have a cab driver give us a tour of Nogales, Sonora and see all the new building, etc. (the border town is at 500,000 souls with new arrivals all the time). The last time we did it, several years ago, the price was $30. Thomas Charles speaks fluent Spanish so he talked with one Flaco Corrillo (Flaco is Spanish for skinny) who told us he would give us a tour for $15. That was a red flag, so I was on guard. Flaco took us by the old Canal Street, which has been completely made over into a legitimate business park. Then we drove up to a ritzy neighborhood with Vegas style homes. One of them was pock-marked with dobs of plaster and Flaco told us there was a big shootout a couple of years ago with 45 narco-trafficers who were holed up in the house. Quite a few were killed and then five wounded dudes were being transported to the airport and the cops hit a speed bump and flipped killing all five of the wounded bad guys, plus the two coppers. Flaco looks a bit sullen here, but he was quit funny, laughing and joking the entire time. Forty-five minutes later we tell him we want to go to La Roca for a nightcap before returning to the U.S. so Flaco battles his way down the main thoroughfare and we pull into the alley where the legendary La Roca sits, and it is closed. So we decide to call it a night and tell Flaco to return us to the border. He has to go back south for about five blocks, then turns into the traffic jam heading towards the border and my blood pressure is rising as we inch towards the line. By now, I'm really paranoid. I can see him charging us $50 or more. It's not that he didn't earn it, but I'm irritated by the way it got set up like this and I'm really nervous about what the price will be. He could charge us $75 or more. Fifteen minutes later, he pulls up to the cab station by the crossing and we all get out. He comes around to our side of the cab and Tommy asks how much we owe him. Flaco shrugs sheepishly and says, "Is $25 okay?" T. gave him $30 and we thanked him profusely for a great time. I wanted to hug Flaco! This totally restored my faith in humanity, not to mention Nogales cab drivers. What a good guy! Made me so happy. It was a great little Christmas present. "Everybody in the world loves Mexican food." Back from the road trip to find the best Mexican food on the planet. We really lucked out in Nogales, Sonora and hooked up with a cab driver named Flaco Carrillo (Flaco is Spanish for skinny) who took us on a grand tour of the city, including a big house in the posh part of town where narco trafficers shot it out with the police. Flaco gave us a running commentary of the fight (quite a few cartel guys were killed and then when the wounded were being transported to the airport, they hit a speed bump killing the wounded and two more policemen). Photos tomorrow. Daily Whipout, "Leaving Kingman for The Last Time"
"Must write and accuse you of making a very respectable 64-year-old lady 'steal' today." After our Nogales run to find the best Mexican food in the world (Asadero La Salida in Nogales, Sonora and El Zarape in Nogales, Arizona), we motored up to Tucson to take in the number one college basketball team in the nation. After landing at the Big Blue House B&B at 6th Avenue and University, we walked down to campus to get our tickets upgraded. While we were standing in line, out came these dudes. That's Matt Korcheck, Brandon Ashley and Jordin Mayes with T. Charles outside the McKale Center ticket window. They crushed T's alma mater, NAU five hours later: 77-44. "The Wildcats will win if I don't watch the last quarter." T. Charles and BBB in front of the Longhorn at Amado, Arizona. 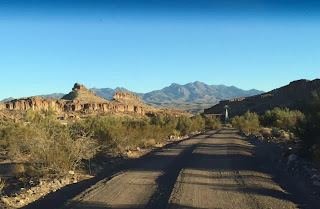 Took the back way to Arivaca (over the cow?) and then down a forest service road to Nogales where we encountered a border patrolman arresting an illegal. That was weird. One agent and one illegal crosser. Lights on, in a wash, in the middle of nowhere. Bizarre to say the least. Got to Nogales at about 3:30 and crossed the border for more Mexican food. Details to come. "In Mexico if it doesn't kill you, it makes you fat." Master Shot: Al Bell's Flying A for the movie "Edge of Eternity"
I am standing to the left with a ton of crew members and trucks parked everywhere. It was cold that morning and quite a few of us were in the office most of the time. Two guys were talking about the hair raising scenes they had just filmed at the Grand Canyon with stunt doubles leaning out of the bat guano bucket and faking a fight scene. Gusts of wind rocked the gondola and according to the guys talking, the fact that the stunt doubles had cables tied to their wrists was the only thing that saved them. I, of course, didn't have a clue what this meant until I attended the premiere at the State Theater and saw the fight scene at the end, high over the Grand Canyon. Meanwhile, back at my dad's service station, who is this character actor, who plays the service station attendant? Familiar character actor playing Flying A service station attendant. That's Harry Tyndall's Caddie parked outside the Tydeway Cafe in the background. Gabbing about a mysterious killer with the Hualapais and Radar Hill in the background. Coincidentally I'm working on a new True West Moment on Lewis Kingman who got to name the town I grew up in because he surveyed the streets for the railroad (no town existed before the survey). So my dilemma is what kind of transit did Lewis use in 1880? Would he have a flagman or rodman or chainmen? He allegedly laid out the streets so that a wagon could turn around so the streets are very wide. Almost too wide. I dream of doing these True West Moments and books and documentaries but sometimes I doubt the dream. Gee, I wonder what ol' Walt has to say about this? Remember the Gene Autry movie, "Man From Music Mountain"? The story was inspired by the real Music Mountains in Mohave County, named because Beale's men thought the strata looked like music bars. The mountains that inspired "Man From Music Mountain"
When Boulder Dam opens, the Southwest awaits the electrical power that will soon be available. Although Gold River, Arizona, is not scheduled for electricity yet, The Western Development Company is trying to convince people that it is, and as an inducement, is offering everyone who buys land in Gold River fifty shares in the Betsy Lee Mine. The formerly deserted town becomes the new home to dozens of victims of the swindle, who need electricity to open businesses. When local rancher Gene Autry and his men ride into town, he realizes that John Scanlon and William Brady, backers of the development company, are swindlers, but he can't convince the new arrivals. Hairdresser Helen, to whom Gene is attracted, and her friend Patsy, who is smitten with Gene's friend, Frog Milhouse, need the income from their new shop so badly that Gene resolves to help them and the others by using his own money to pay the general store owner so that the townspeople can buy on credit. When he suggests that people get their money back from Scanlon, he only succeeds in making Scanlon want him permanently out of the way. Using gold dust that his father kept from a strike in Alaska, Gene decides to "salt" the Betsy Lee and tells Frog to go to a saloon and brag to Scanlon's men that he has found a rich vein of ore. The gang then goes to the mine to see if Frog's claim is real. Gene meanwhile convinces the townspeople to try and sell the mine stock back to Scanlon. As they are ready to do so, Buddy, a young orphan left in Gene's care who doesn't know about the ruse, then rides into town and tells everyone about the gold found in the mine. The town then turns against Gene, thinking he is mixed up with Scanlon, but, when Helen discovers that Gene has been paying everyone's grocery bills, she realizes that he has been trying to help them. As reports of a gold rush spread, the town is inundated with new people, so the power company decides to bring in electricity after all. During a dance to celebrate, Scanlon and Brady decide to take another look at the mine before agreeing to Gene's new offer of buying forty-nine percent of the mine for machinery needed to work it. After killing a guard, they discover the truth, but accidentally set off a burglar alarm rigged by Frog as the electricity starts. Gene then rushes out to the Betsy Lee, and, during a gun battle, part of the mine caves in, revealing a genuine vein of gold. As Brady rushes to Scanlon to tell him to take the town's offer, Gene and Frog sneak out a back entrance and arrive just in time to stop the sale and arrange for the sheriff to arrest Scanlon and his gang. So predictable, so lame, and yet so compelling. Why is that? Daily Whipout: "Kingman at The Crossroads: Neon Necklace"
This is Kingman at night, from the air, with the lights of traffic on Route 66 and Highway 93 forming a neon necklace as seen from space. Spacey, eh? "Route 66 is a necklace of neon lights. . ."
Back in the office and working hard on the March issue. I know: we work wayyy out. Check this out. This is Cordelia Kay of Mohave County, who was known as the Lady Miner. Saw this at the Mohave Museum last Friday after our meeting there. "One of the annoying things about believing in free choice and individual responsibility is the difficulty of finding somebody to blame your problems on. And when you do find somebody, it's remarkable how often his picture turns up on your driver's license." Old Route 66 swings through that curve at bottom, center, then angles up and eastward thru Valentine, Crozier Springs and up on the plateau, upper middle right, where Truxton sits. To the left of that bald spot you can make out the horizontal stripes of Music Mountains, then behind it you see how close the Grand Canyon dips southward before arcing northward towards Lake Mead. At the extreme bottom is Round Valley. "I'll bet this looks funny from the air." Back from a quick Route 66 reference road trip. Left on Friday morning at 6:30 with my art director, Daniel Harshberger and our unpaid intern and camera operator, John Nelson. Stopped in Wickenburg at Ike's Cook Shack for a quick breakfast. Got to Kingman at 10 and took this reference photo at Fourth and Beale Street for a painting I want to do of Lewis Kingman surveying the town streets (wanted to see what he could see if the buildings were gone, i.e. those classic buttes towards Coyote Pass). Be A Real Frutti, Not A Flat-Footed-Floogie! Afterwards, drove further down into the Beast for a storytelling affair at a converted church at Third Street and I-10. Told the story of George Warren in about four minutes flat (we were supposed to keep our stories to five minutes and the guy in front of me went for seven). That's the seven minute guy with his arms folded. It was an intelligent audience and I hate to admit it, but I think some of them actually believed me. Ran off the stage, grabbed a chicken kabob in the lobby and a glass of wine and drove home. it's an hour run. Got home at 7:30. Long day. Got up this morning and worked on three different versions of cover ideas. This is one of them. Daily Whipout: "The Baddest Boy In The Whole Damn Land—The 66 Kid"
"I fell out when I glimmed your latest mag. I think your inkings are frantic. Rock and Roll is the craziest, and I'm hip. I copped the word 'frampton' for cool or crazy. I hope you dig my little ink phrase—'cause I'm trying to get on to the hip ways." "We 'warm-charms' down here think R 'n' R is the mostest! Instead of speakin' of such persons as cool cats, we hippers say 'warm ducks.' When some deal is the most, we call it 'real frutti.' A smart girl is a 'keen-Irene.' One who can't be-bop is a 'FLAT-FOOT- FLOOGIE." "Skin Me, My Man: dig my jive, if you can. I've got correction bit to hit you with. It's about that daffy-nition for a more square square (that's from nowhere). A cube should be a 'square in 3-D.' Now we're hip—so don't slip on down to 'fool's paradise.' Instead get with this cool advice." Hep Cats Writin' to Father Bear! If you thought the recent Emmy win was a fluke, check this out. Back in 1974 The Razz Revue crew received an extra big Oscar at Old Tucson Studios for "a record number of attempts at trying to be humorous." I believe the old record was 12. L to R: Dan The Man Harshberger, Terry Townsend and BBB receive an extra big Oscar with a floppy base—note how statue doesn't line up with base, from a guy with madras pants and a Mexican wedding shirt, so popular at the time. We were shooting our first Old West issue of the Razz (we did two) and we traded ad space for the privilege of shooting on the grounds. When the manager of operations noticed we were shooting "humorous" scenes he brought out this oversized statuette and wondered if we could use it in our "zany antics." I said sure, "Hand it to me." "On Behalf the Academy I'd like to thank the makers of my top hat and the slim fitting bell bottoms from Jeff Bloom's Eclipse on Fourth Avenue in Tucson)." True West landed on the front page of the Tombstone Epitaph yesterday. Good article by Carlos Herrera on The Town Too Tough to Die finally making our Top Ten Towns list. Top head: "About Dang Time!" Ha. Dan The Man and I attended a couple of bizarre meetings today. One of them twice. Drove down into the Beast and landed at Channel 8 but we were told our meeting had been cancelled because our host was out sick. Had a meeting with another producer, left, got two blocks away and got a call from the original host asking us where we were. Went back and had a second meeting which was quite daunting. Learned about all the things we can't do without licensing and releases (from family movies taken in 1962!). That was discouraging. Not there, but getting closer. Four cover comps due on Friday. I had a plan but it evaporated. Gee, I wonder what respected documentarian Ms. Baichwal has to say about that? "Have a plan, but be ready to abandon it at any moment." Working late tonight. Talking to Stuart Rosebrook about assignments in March. He is all over it. We're on a roll. The big Fountain-Garrett assassination package (12 pages!) went to the printer this morning. Final corrections that is. The rest of the magazine went out last Thursday. So I have been trying to find photo reference for Floyd Cisney's Arizona Highway Patrol car which he drove in the late fifties. I remember that it was white and had unique side symbols but I have not been able to find anything even close. Well, yesterday, Robert Dell of Kingman posted some screen captures from "Edge of Eternity" a 1959 film which is a time capsule of Mohave County life and style. And there it is—Floyd Cisney's ACTUAL car pulling up to Pierce Ferry and if I remember correctly Floyd himself gets out. Also working on night neon and night drivers and Mo-ped Mamas, a concept Dan and I came up with way back in the 1970s. In fact we filmed a bit for Channel 5 and one of the Mamas was Kathy Radina, before we were an item. Somewhere I have the footage of that and we need it for the doc. And speaking of Mamas, here's one of the. . .
"The story is the first thing and the last thing." I have been using a Franklin Daytimer since 1994—almost 20 years. This morning Kathy asked me if I wanted a refill for 2014 and I had to admit I rarely use it anymore because my iPhone has all the information I need. It even reminds me that I have a speech tomorrow, the time, and a map. How can you compete with that? Poor guys—Franklin—I feel for them. My big Ol' Monarch Franklin Daytimer about to be retired. Interestingly, my daughter Deena still uses hers and says she likes having everything she needs spread out in front of her at meetings. And speaking of loss, we just lost 55 stores in the Chicago area that used to carry True West. I assume it was a chain that went under. Our distributor wants to know where they should destroy the 300 issues that normally go to them. I said, "Destroy them? Hell no! I'll drive to Chicago to get them if I have to," and they said, no, I can't come get them out of the chain of distribution. And I said, "Remind me why I got into this business?" Daily Whipout, "Jack Kerouac Attack"
"Congratulations on the new book project! I know it will be a fabulous trip." Yes, quite fortuitous because "On The Road" was a good part of the inspiration to do "The 66 Kid." Gee, I wonder if Jack has any advice on how to do the book? "Great things are not accomplished by those who yield to trends and fads and popular culture." Oliver Lee's Gang of Seven? Daily Whipout, "Storm Is Ah Comin'"
Although three suspects are always mentioned in the Fountain case—Oliver Lee, Bill McNew and James Gililland—there were likely more participants. We know that two other cowboys were seen trailing the Fountains from Lincoln to Tularosa and, according to the contributor who dropped out this morning, the Pinkerton reports show seven different horse tracks around the abandoned buggy. It would make sense that Lee would seek support from his neighbors and friends to stop what he viewed as a corrupt official who was bent on sending them all to the pen for ten years. Here we see Lee, on his white horse, sending his riders out to their posts as a huge storm rolls in. "Guitars will play your grand finale, down in some Tularosa alley. . ."
Daily Whipout, "Fountain is herded right into the sights of the best shooter on Oliver Lee's gang"
This, of course, is classic deer hunting strategy: to drive game into the sights of a shooter. "Aim low, they're riding Shetlands!" Daily Whipout, "Chalk Hill Without the Fountains or Wagon"
Daily Whipout, "Topping Chalk Hill: By the Time Fountain Saw The Riders It Was Too Late"
Going home for lunch to whip out the climatic scene. Wish me luck. Fountain Buckboard, or, Fountain Buggy? Getting closer to wrapping up the big Assassination of Pat Garrett—and The Fountain Murder features. I did an FPO (for position only) illustration a couple days ago of the Fountains conveyance on the day they were ambushed. In the court testimony in the court case, Albert Fall uses the term buggy and buckboard to describe the victims ride, sometimes in the same sentence. So what kind of a wagon were they in? Daily Whipout, "The Fountains On Their Way to Chalk Hill"
Yes, an Apache at Blazer's Mill gifted Fountain with a pony and the lawyer tied it to the back of the wagon to take home for his kids. He also had 50 pounds of uncut alfalfa in a sack in the back. The two had a blanket draped over their laps to ward off the February cold. "From what I understand from the Fountain family, it was a buckboard body but covered (which would explain why it is called both a buckboard and buggy in trial testimony). The Colonel's son Albert (who was part of the search party) did a painting of his father and brother in the buckboard years later, and it showed an uncovered buckboard (a rear view of what you have below), but Albert's granddaughter, Mary Alexander, told me that the buckboard was in fact covered, but Albert wanted to be able to show his father and brother in the panting." —Corey Recko, author of "Murder On The White Sands: The Disappearance of Albert and Henry Fountain"
Daily Whipout, "Waiting for The Mark"
I'm sure there are more similarities, but those are the first things that popped out at me. "How did you first find the trail of Colonel Fountain's buckboard? Did you not testify this morning that it was no trouble for you to find the buggy tracks. . ."
Home stretch of our major Fountain-Garrett murder feature. Here is a photo montage of the Pat Garrett death site which I took in 1991. Daily Whipout, "Into The Valley of Death"
Wayne Brazel rode along side Garrett's buggy as the two argued over goats. Worked this morning on finishing the Pat Garrett splash page illustration. Pardon my French, but this is called "A Piss Poor Way to Die"
Daily Whipout, "Pat Garrett Gets His"
"Men like myself, who spend their lives making enemies of the pests of scoiety, must expect to be killed sometime." Worked most of the afternoon on a painting for our Pat Garrett splash page. Didn't fall. Hope to finish in the morning. When we flew home from Pasadena on Friday, I got a good view of Burbank and Universal City. Yes, those are the Cerbats, north of Kingman. That's the old Duval Mine, middle left, and Red Lake, way up at the right. Brenda and Kevin Stockbridge live down there in that gaggle of houses at bottom, right. I believe that's Felspar Butte with the long pointed shadow, at middle, bottom. Not sure why, but I always seem to end up here. Gee, I wonder how that relates to "The 66 Kid"? "If it doesn't need to start at a certain place and end at a certain place, then it might not be a movie."